In an effort to reach more patrons and spread innovation, librarians are taking their digital learning and staff development programs on the road. The Carnegie Library of Pittsburgh offers everything you would expect at a library: books, computers, story time for the little ones. But a few of its branches have become destinations for teenagers who record audio, edit videos, play video games, or craft. 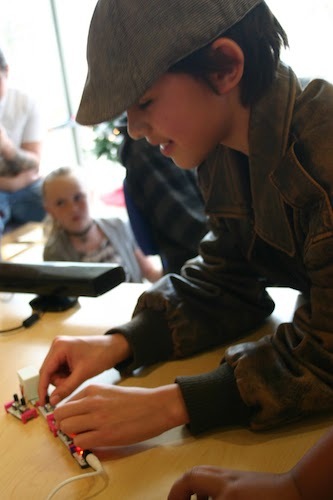 In 2010, the Carnegie Library of Pittsburgh (CLP) was one of several sites to receive funding from the Institute of Museum and Library Services (IMLS) and the John D. and Catherine T. MacArthur Foundation to launch Learning Labs in Libraries and Museums, digital spaces where teens can experiment with new tools and build 21st-century skills. The five Labs @ CLP were born out of that initiative and have built a devoted following. But in the 19-branch system, only a fraction of CLP’s visitors and staff had access to the programming and equipment. Mobile maker workshops are held at libraries throughout New Mexico. About two years into the program, CLP’s digital learning librarian, Corey Wittig, wondered about reaching a wider audience. CLP lacked the capacity to open labs at each site, so they did the next best thing and took their program on the road. In recent years, libraries have been heralded as ideal locales for hands-on, interest-driven learning. In addition to reading and research, libraries provide safe, accessible spaces for young people to collaborate, connect with caring adults like librarians, artists, and volunteers, and experiment with traditional and cutting-edge tools. At the Rockwood Library in Oregon, for example, kids can come after school and on weekends to noodle around with robotics equipment and animation software. At libraries, students who may feel disengaged in traditional classrooms can pursue their passions and learn as they go. In an effort to bring hands-on learning and professional development to as many people as possible, libraries like CLP are going mobile with their “maker” programming. Labs @ CLP staff mentors are paired with teen librarians at other branches, which they visit quarterly if not more often. The mentor trains the specialist and co-facilitates the program during the visit. The branches can also request kits packed with materials and curriculums written in simple comic book form. There are kits for each of the labs’ standard projects: robotics, soldering, stop-motion animation, printmaking, and sewing. The branch specialist uses the kits to lead projects with interested students. Beyond reaching more teens, one goal of the mobile program—called Labs on Location—is to upload knowledge to staff at each branch. In many cases, he said, branch specialists and librarians have built relationships with regular visitors. The adults encourage them to push themselves, building trust and a mentorship dynamic that Wittig says is crucial to library learning programs. The mobile labs offer yet another way to add engaging material and practical methods to existing offerings. At one site, teens were already designing video games and holding a regular Pokémon club. At an upcoming Labs on Location workshop, they will learn how to use animation gaming software to turn their ideas into playable Pokémon-style games. Other libraries have launched traveling maker initiatives too. Like the Labs @ CLP, YOUmedia Chicago has established space for interest-driven digital-media learning for teens at the Chicago Public Library. But there isn’t enough staff or funding to build YOUmedia spaces across the entire system, which includes 80 branches and 25 teen programs. A new mobile program allows YOUmedia staff to share their equipment and skills. YOUmedia mentors have begun writing curriculums and making how-to videos for colleagues at other branches. Like CLP, they have also started building kits that travel through the system. The kits can include screen-printing equipment, podcast recording devices, STEM learning tools, and other content. Some librarians use the material to create programming that is popular at YOUmedia, said coordinator Eric Reyes, while others adapt it for their own needs. Both the Chicago and Pittsburgh Learning Labs staff have made their comic book curricula and how-to videos downloadable at the YOUmedia Community of Practice website, bringing the maker programming to practitioners outside of their immediate networks. In less urban areas, mobile maker programs can reach isolated communities, or teens and staff who lack experience with hands-on maker activities. As part of a New Mexico initiative funded in part by IMLS, a makerspace called Parachute Factory drops in to host workshops at libraries throughout the state. “In New Mexico, we have many small, rural libraries, often with only one or two staff members,” said Ryanne Cooper, New Mexico State Library bureau chief. In this case, Parachute Factory caters to the sites’ specific needs. “What is really key to their success is that they show up with everything needed—and plans for contingencies,” Cooper said. They bring supplies for creative maker projects like interactive embroidery with conductive thread, take care of cleanup, and report back afterward. Mobile making is rarely the end goal, Wittig said. He considers Labs on Location to be a “scouting mission” that will help CLP determine where next to invest in more permanent programming. But until the capacity is there, new mobile endeavors offer an innovative means of stretching resources, training adult mentors, and reaching a larger network of youth.